"The contractors will be removing the steel track structure from the last old track where it crosses over Broadway, south of Leland. Along with removing the steel, they will also be demolishing the associated foundations and temporary concrete supports. Broadway will be shut down to vehicles starting at 5am on Saturday, April 8, and will open back up to vehicular traffic Sunday at 4pm. The closure will be from Wilson Avenue to just north of Clifton. Sidewalks will remain open with periodic closures as needed to safely perform the work overhead. There will be noise, dust, and heavy equipment in the area as a result of this work. The Wilson Street closure will be removed at end of shift on Saturday." We could NOT be happier to see those pillars that have been in the driving lanes on Broadway for 110 years disappear. They served Uptown well, but we won't miss them a bit. It would be nice if they finished the platform that is already in use with an working elevator and escalator. And then start the other platform. That would've been ideal for people with disabilities and the elderly. AND, parents with strollers and young children. I don't know the specifics of construction timelines. We have been talking for years about how badly Uptown needs ADA-compliant rapid transit. 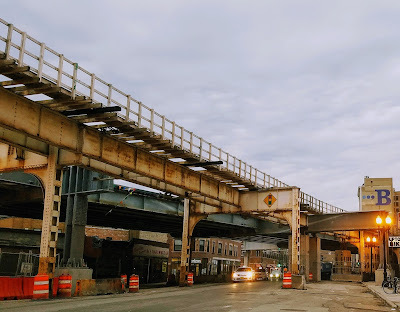 But since there has never been easy access to Uptown's trains, ever, in the 117 years since trains started running to Uptown, I'm okay with waiting a few more months. By the end of the year, there will be both escalator and elevator service for the first time at a station between Addison and Granville. I am not being cavalier. My mother was disabled and unable to go up even one stairstep for most of her life. I know how it is to have to deal with non-ADA-compliant facilities. I am THRILLED that the elderly and disabled will finally be able to get to the trains in their own community.